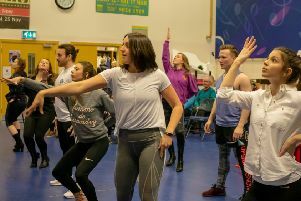 Belfast Operatic Company are putting the final touches to their latest production, Jekyll and Hyde, which will be staged at the Grand Opera House in Belfast from Tuesday April 4 until Saturday April 8. Starring Dungannon born barrister Karl McGuckin in the complex title role, the show is a powerful and evocative story which tells the tale of Doctor Henry Jekyll and the two women who accompany him on a path of discovery. His scientific ambitions lead him to test his own experiments and unshackle the darkness within him, forcing an epic struggle between good and evil. Including the classic songs ‘This Is The Moment’, and ‘Someone Like You’, its hauntingly beautiful pop rock score features some of Broadway’s best known songs. Jekyll & Hyde has mesmerised audiences the world over, playing to critical acclaim and receiving four Tony nominations including Best Book of a Musical.